On February 25, 1964, underdog Cassius Clay, better known as Muhammad Ali, fought defending champion Charles "Sonny" Liston for the world heavyweight title in Miami Beach, Florida. Although it was nearly unanimously believed that Clay would be knocked out by round two if not earlier, it was Liston who lost the fight after refusing at the beginning of round seven to continue fighting. This fight was one of the largest upsets in sports history, setting Cassius Clay on a long path of fame and controversy. Cassius Clay, renamed Muhammad Ali right after this historic fight, had started boxing at the age of 12 and by 18 had won the light-heavyweight gold medal at the 1960 Olympic Games. Clay trained long and hard to be the best at boxing, but many at the time thought his fast feet and hands didn't have enough power in them to beat a true heavyweight champion like Liston. Plus, the 22-year-old Clay, a decade younger than Liston, seemed a bit crazy. Clay, known as the "Louisville Lip," was constantly boasting that he would knock out Liston and calling him "the big, ugly bear," riling up both Liston and the press into a frenzy over his wild taunts. While Clay used these tactics to unsteady his opponents and to garner publicity for himself, others thought it was a sign that he was afraid or just plain crazy. Sonny Liston, known as "the Bear" for his giant size, had been the world heavyweight champion since 1962. He was rough, tough, and hit really, really hard. Having been arrested more than 20 times, Liston learned to box while in prison, becoming a professional boxer in 1953. Liston's criminal background played a big role in his unlikable public personae, but his hard-hitting style earned him enough wins via knockout that he was not to be ignored. For most folks in 1964, it seemed a no brainer that Liston, who had just knocked out the last serious contender for the title in the first round, would pummel this young, loud-mouthed challenger. People were betting 1 to 8 on the match, favoring Liston. At the start of the fight on February 25, 1964, at the Miami Beach Convention Center, Liston was overconfident. Although nursing an injured shoulder, he expected an early knockout like his last three big fights and so had not spent much time training. Cassius Clay, on the other hand, had trained hard and was thoroughly ready. Clay was faster than most other boxers and his plan was to dance around the powerful Liston until Liston tired out. Ali's plan worked. Liston, weighing in at the slightly heavy 218 pounds, was surprisingly dwarfed by the 210 1/2-pound Clay. When the bout began, Clay bounced, danced, and bobbed frequently, confusing Liston and making a very difficult target. Liston tried to get a solid punch in, but round one ended without much actual hitting. Round two ended with a cut under Liston's eye and Clay not only still standing, but holding his own. Round three and four saw both men looking tired but determined. At the end of the fourth round, Clay complained that his eyes were hurting. Wiping them with a wet rag helped a little, but Clay basically spent the entire fifth round trying to evade the blurry Liston. Liston tried to use this to his advantage and went on the attack, but the lithe Clay surprisingly managed to stay up the whole round. 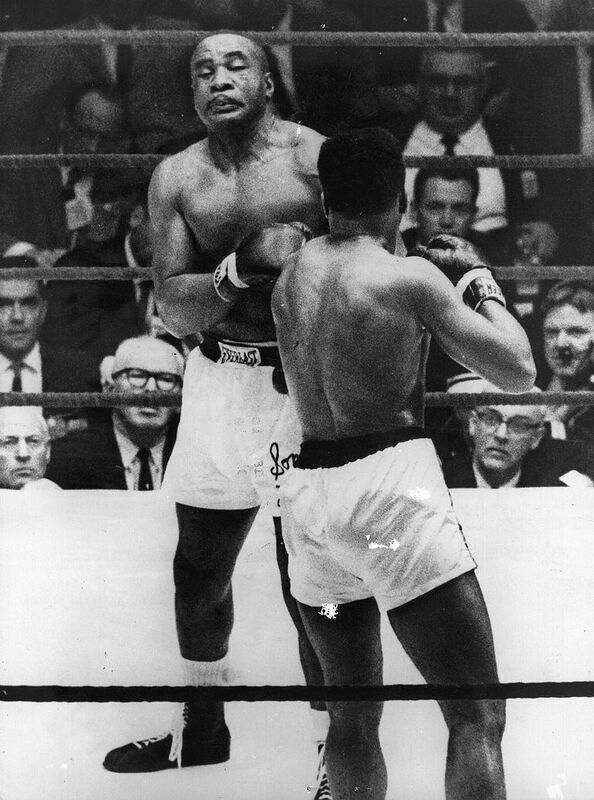 By the sixth round, Liston was exhausted and Clay's eyesight was returning. Clay was a dominant force in the sixth round, getting in several good combinations. When the bell rang for the start of the seventh round, Liston stayed seated. He had hurt his shoulder and was worried about the cut under his eye. He just didn't want to continue the fight. It was a real shock that Liston ended the fight while still seated in the corner. Excited, Clay did a little dance, now called the "Ali shuffle," in the middle of the ring. Cassius Clay was declared the winner and became the heavyweight boxing champion of the world.